The detection and characterization of chemical adducts on proteins is of increasing interest. Here, we described a step-by-step procedure to identify unknown chemical adduct modifications on proteins resulting from the interaction with a given reactive compound. 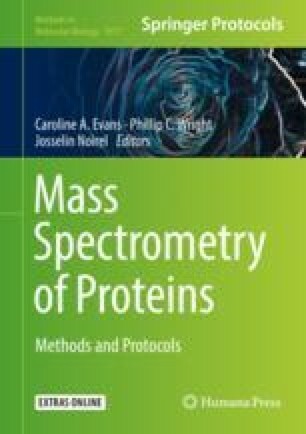 The protocol can be divided into two equally important parts: (1) the wet laboratory work, to produce high quality mass spectrometry (MS) data of in vitro modified proteins and (2) the dry laboratory work, to analyze the generated MS data and provide highly confident qualitative and quantitative results on the chemical composition and amino acid localization of adducts. This protocol is applicable to the study of any pharmaceutical or chemical compound forming covalent protein adducts, detectable in LC-MS/MS experiments. The online version of this chapter ( https://doi.org/10.1007/978-1-4939-9232-4_8) contains supplementary material, which is available to authorized users. This study was supported by the Swiss Centre for Applied Human Toxicology and the Swiss National Science Foundation (grant No 32003B_143809). The authors would like to thank the Proteomics Core Facility of the University of Geneva for providing full access to the LTQ Orbitrap MS instrument. None declared conflict of interest.